"Celebes" redirects here. For the painting by Max Ernst, see The Elephant Celebes. Sulawesi, formerly known as Celebes (/ˈsɛlɪbiːz, sɪˈliːbiːz/), is an island in Indonesia. One of the four Greater Sunda Islands, and the world's eleventh-largest island, it is situated east of Borneo, west of the Maluku Islands, and south of Mindanao and the Sulu Archipelago. Within Indonesia, only Sumatra, Borneo and Papua are larger in territory, and only Java and Sumatra have larger populations. The landmass of Sulawesi includes four peninsulas: the northern Minahasa Peninsula; the East Peninsula; the South Peninsula; and the Southeast Peninsula. Three gulfs separate these peninsulas: the Gulf of Tomini between the northern Minahasa and East peninsulas; the Tolo Gulf between the East and Southeast peninsulas; and the Bone Gulf between the South and Southeast peninsulas. The Strait of Makassar runs along the western side of the island and separates the island from Borneo. The name Sulawesi possibly comes from the words sula ("island") and besi ("iron") and may refer to the historical export of iron from the rich Lake Matano iron deposits. The name came into common use in English following Indonesian independence. The name Celebes was originally given to the island by Portuguese explorers. While its direct translation is unclear, it may be considered a Portuguese rendering of the native name "Sulawesi". Sulawesi is the world's eleventh-largest island, covering an area of 174,600 km2 (67,413 sq mi). The central part of the island is ruggedly mountainous, such that the island's peninsulas have traditionally been remote from each other, with better connections by sea than by road. The three bays that divide Sulawesi's peninsulas are, from north to south, the Tomini, the Tolo and the Boni. [n 1] These separate the Minahassa or Northern Peninsula, the East Peninsula, the Southeast Peninsula and the South Peninsula. The Strait of Makassar runs along the western side of the island. The island is surrounded by Borneo to the west, by the Philippines to the north, by Maluku to the east, and by Flores and Timor to the south. The Selayar Islands make up a peninsula stretching southwards from Southwest Sulawesi into the Flores Sea are administratively part of Sulawesi. The Sangihe Islands and Talaud Islands stretch northward from the northeastern tip of Sulawesi, while Buton Island and its neighbours lie off its southeast peninsula, the Togian Islands are in the Gulf of Tomini, and Peleng Island and Banggai Islands form a cluster between Sulawesi and Maluku. All the above-mentioned islands, and many smaller ones are administratively part of Sulawesi's six provinces. The island slopes up from the shores of the deep seas surrounding the island to a high, mostly non-volcanic, mountainous interior. Active volcanoes are found in the northern Minahassa Peninsula, stretching north to the Sangihe Islands. The northern peninsula contains several active volcanoes such as Mount Lokon, Mount Awu, Soputan and Karangetang. According to plate reconstructions, the island is believed to have been formed by the collision of terranes from the Asian Plate (forming the west and southwest) and from the Australian Plate (forming the southeast and Banggai), with island arcs previously in the Pacific (forming the north and east peninsulas). Because of its several tectonic origins, various faults scar the land and as a result the island is prone to earthquakes. Sulawesi, in contrast to most of the other islands in the biogeographical region of Wallacea, is not truly oceanic, but a composite island at the centre of the Asia-Australia collision zone. Parts of the island were formerly attached to either the Asian or Australian continental margin and became separated from these areas by vicariant processes. In the west, the opening of the Makassar Strait separated West Sulawesi from Sundaland in the Eocene c. 45 Mya. In the east, the traditional view of collisions of multiple micro-continental fragments sliced from New Guinea with an active volcanic margin in West Sulawesi at different times since the Early Miocene c. 20 Mya has recently been replaced by the hypothesis that extensional fragmentation has followed a single Miocene collision of West Sulawesi with the Sula Spur, the western end of an ancient folded belt of Variscan origin in the Late Paleozoic. Before October 2014, the settlement of South Sulawesi by modern humans had been dated to c. 30,000 BC on the basis of radiocarbon dates obtained from rock shelters in Maros. No earlier evidence of human occupation had at that point been found, but the island almost certainly formed part of the land bridge used for the settlement of Australia and New Guinea by at least 40,000 BCE. There is no evidence of Homo erectus having reached Sulawesi; crude stone tools first discovered in 1947 on the right bank of the Walennae River at Berru, Indonesia, which were thought to date to the Pleistocene on the basis of their association with vertebrate fossils, are now thought to date to perhaps 50,000 BC. Following Peter Bellwood's model of a southward migration of Austronesian-speaking farmers (AN), radiocarbon dates from caves in Maros suggest a date in the mid-second millennium BC for the arrival of a group from east Borneo speaking a Proto-South Sulawesi language (PSS). Initial settlement was probably around the mouth of the Sa'dan river, on the northwest coast of the peninsula, although the south coast has also been suggested. Subsequent migrations across the mountainous landscape resulted in the geographical isolation of PSS speakers and the evolution of their languages into the eight families of the South Sulawesi language group. If each group can be said to have a homeland, that of the Bugis – today the most numerous group – was around lakes Témpé and Sidénréng in the Walennaé depression. Here for some 2,000 years lived the linguistic group that would become the modern Bugis; the archaic name of this group (which is preserved in other local languages) was Ugiq. 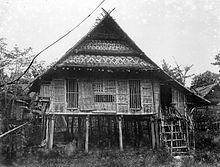 Despite the fact that today they are closely linked with the Makasar, the closest linguistic neighbours of the Bugis are the Toraja. Pre-1200 Bugis society was most likely organised into chiefdoms. Some anthropologists have speculated these chiefdoms would have warred and, in times of peace, exchanged women with each other. Further, they have speculated that personal security would have been negligible and head-hunting an established cultural practice. The political economy would have been a mixture of hunting and gathering and swidden or shifting agriculture. Speculative planting of wet rice may have taken place along the margins of the lakes and rivers. In Central Sulawesi, there are over 400 granite megaliths, which various archaeological studies have dated to be from 3000 BC to AD 1300. They vary in size from a few centimetres to around 4.5 metres (15 ft). The original purpose of the megaliths is unknown. About 30 of the megaliths represent human forms. Other megaliths are in form of large pots (Kalamba) and stone plates (Tutu'na). In October 2014 it was announced that cave paintings in Maros had been dated as being about 40,000 years old. 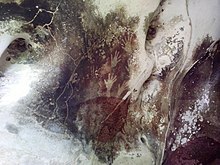 Dr Maxime Aubert, of Griffith University in Queensland, Australia, said that the minimum age for the outline of a hand was 39,900 years old, which made it "the oldest hand stencil in the world" and added, "Next to it is a pig that has a minimum age of 35,400 years old, and this is one of the oldest figurative depictions in the world, if not the oldest one." Starting in the 13th century, access to prestige trade goods and to sources of iron started to alter long-standing cultural patterns and to permit ambitious individuals to build larger political units. It is not known why these two ingredients appeared together; one was perhaps the product of the other. In 1367, several identified polities, located on the island, were mentioned in the Javanese manuscript Nagarakretagama dated from the Majapahit period. Canto 14 mentioned polities including Gowa, Makassar, Luwu and Banggai. It seems that by the 14th century, polities in the island were connected in an archipelagic maritime trading network, centered in the Majapahit port in East Java. By 1400, a number of nascent agricultural principalities had arisen in the western Cenrana valley, as well as on the south coast and on the west coast near modern Parepare. The first Europeans to visit the island (which they believed to be an archipelago due to its contorted shape) were the Portuguese sailors Simão de Abreu, in 1523, and Gomes de Sequeira (among others) in 1525, sent from the Moluccas in search of gold, which the islands had the reputation of producing. A Portuguese base was installed in Makassar in the first decades of the 16th century, lasting until 1665, when it was taken by the Dutch. The Dutch had arrived in Sulawesi in 1605 and were quickly followed by the English, who established a factory in Makassar. From 1660, the Dutch were at war with Gowa, the major Makassar west coast power. In 1669, Admiral Speelman forced the ruler, Sultan Hasanuddin, to sign the Treaty of Bongaya, which handed control of trade to the Dutch East India Company. The Dutch were aided in their conquest by the Bugis warlord Arung Palakka, ruler of the Bugis kingdom of Bone. The Dutch built a fort at Ujung Pandang, while Arung Palakka became the regional overlord and Bone the dominant kingdom. Political and cultural development seems to have slowed as a result of the status quo. In 1905 the entire island became part of the Dutch state colony of the Netherlands East Indies until Japanese occupation in the Second World War. During the Indonesian National Revolution, the Dutch Captain 'Turk' Westerling led campaigns in which hundreds, maybe thousands died during the South Sulawesi Campaign. Following the transfer of sovereignty in December 1949, Sulawesi became part of the federal United States of Indonesia, which in 1950 became absorbed into the unitary Republic of Indonesia. 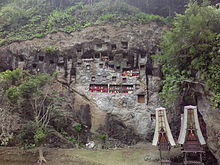 Toraja burial site. 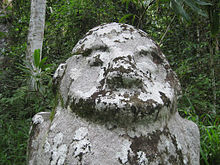 Tau-tau, the statue representing the buried people, can be seen in niches on the cliff. The Portuguese were rumoured to have a fort in Parigi in 1555. The Kaili were an important group based in the Palu valley and related to the Toraja. Scholars relate that their control swayed under Ternate and Makassar, but this might have been a decision by the Dutch to give their vassals a chance to govern a difficult group. Padbruge commented that in the 1700s Kaili numbers were significant and a highly militant society. In the 1850s a war erupted between the Kaili groups, including the Banawa, in which the Dutch decided to intervene. A complex conflict also involving the Sulu Island pirates and probably Wyndham (a British merchant who commented on being involved in arms dealing to the area in this period and causing a row). In the late 19th century the Sarasins journeyed through the Palu valley as part of a major initiative to bring the Kaili under Dutch rule. Some very surprising and interesting photographs were taken of shamans called Tadulako. Further Christian religious missions entered the area to make one of the most detailed ethnographic studies in the early 20th century. A Swede by the name of Walter Kaudern later studied much of the literature and produced a synthesis. Erskine Downs in the 1950s produced a summary of Kruyts and Andrianis work: "The religion of the Bare'e-Speaking Toradja of Central Celebes," which is invaluable for English-speaking researchers. One of the most recent publications is "When the bones are left," a study of the material culture of central Sulawesi, offering extensive analysis. Also worthy of study are the brilliant works of Monnig Atkinson on the Wana shamans who live in the Mori area. The 2000 census population of the provinces of Sulawesi was 14,946,488, about 7.25% of Indonesia's total population. By the 2010 Census the total had reached 17,371,782, and the latest official estimate (for January 2014) is 18,455,058. The largest city is Makassar. Islam is the majority religion in Sulawesi. The conversion of the lowlands of the south western peninsula (South Sulawesi) to Islam occurred in the early 17th century. The kingdom of Luwu in the Gulf of Bone was the first to accept Islam in February 1605; the Makassar kingdom of Goa-Talloq, centred on the modern-day city of Makassar, followed suit in September. However, the Gorontalo and the Mongondow peoples of the northern peninsula largely converted to Islam only in the 19th century. Most Muslims are Sunnis. Christians form a substantial minority on the island. According to the demographer Toby Alice Volkman, 17% of Sulawesi's population is Protestant and less than 2% is Roman Catholic. Christians are concentrated on the tip of the northern peninsula around the city of Manado, which is inhabited by the Minahasa, a predominantly Protestant people, and the northernmost Sangir and Talaud Islands. The Toraja people of Tana Toraja in Central Sulawesi have largely converted to Christianity since Indonesia's independence. There are also substantial numbers of Christians around Lake Poso in Central Sulawesi, among the Pamona speaking peoples of Central Sulawesi, and near Mamasa. Though most people identify themselves as Muslims or Christians, they often subscribe to local beliefs and deities as well. It is not uncommon for both groups to make offerings to local gods, goddesses, and spirits. Smaller communities of Buddhists and Hindus are also found on Sulawesi, usually among the Chinese, Balinese and Indian communities. The island is subdivided into six provinces: Gorontalo, West Sulawesi, South Sulawesi, Central Sulawesi, Southeast Sulawesi and North Sulawesi. West Sulawesi is a new province, created in 2004 from part of South Sulawesi. The largest cities on the island are Makassar, Manado, Palu, Kendari, Bitung, Gorontalo, Palopo and Baubau. Sulawesi is part of Wallacea, meaning that it has a mix of both Indomalayan and Australasian species that reached the island by crossing deep-water oceanic barriers. The flora includes one native eucalypt, E. deglupta. There are 8 national parks on the island, of which 4 are mostly marine. The parks with the largest terrestrial area are Bogani Nani Wartabone with 2,871 km2 and Lore Lindu National Park with 2,290 km2. Bunaken National Park which protects a rich coral ecosystem has been proposed as an UNESCO World Heritage Site. Early in the Pleistocene, Sulawesi had a dwarf elephant and a dwarf form of Stegodon, (an elephant relative, S. sompoensis); later both were replaced by larger forms. A giant suid, Celebochoerus, was also formerly present. It is thought that many of the migrants to Sulawesi arrived via the Philippines, while Sulawesi in turn served as a way station for migrants to Flores. A Pleistocene faunal turnover is recognised, with the competitive displacement of several indigenous tarsiers by more recently arriving ones and by Celebochoerus by other medium-sized herbivores like the babirusa, anoa and Celebes warty pig. 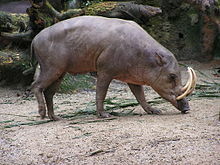 The north Sulawesi babirusa is endemic to Sulawesi. There are 127 known extant native mammalian species in Sulawesi. A large percentage, 62% (79 species) are endemic, meaning that they are found nowhere else in the world. The largest of these are the two species of anoa or dwarf buffalo. Other artiodactyl species inhabiting Sulawesi are the warty pig and the babirusas, which are aberrant pigs. The only native carnivoran is the Sulawesi palm civet (Asian palm and Malayan civets have been introduced). Primates present include a number of tarsiers (T. fuscus, Dian's, Gursky's, Jatna's, Wallace's, the Lariang and pygmy tarsiers) as well as macaques (Heck's, the booted, crested black, Gorontalo, moor, and Tonkean macaques). While most of Sulawesi's mammals are placental and have Asian relatives, several species of cuscus, arboreal marsupials of Australasian origin, are also present (Ailurops ursinus and Strigocuscus celebensis). Sulawesi is home to a large number of endemic rodent genera. Murid rodent genera endemic to Sulawesi and immediately adjacent islands (such as the Togian Islands, Buton Island, and Muna Island) are Bunomys, Echiothrix, Margaretamys, Taeromys and Tateomys as well as the single-species genera Eropeplus, Hyorhinomys, Melasmothrix, Paucidentomys, Paruromys and Sommeromys. Endemic sciurid genera are Hyosciurus, Prosciurillus, Rubrisciurus and Waiomys. While over 20 bat species are present on Sulawesi, only a portion of these are endemic: Rhinolophus tatar, Scotophilus celebensis and the megabats Acerodon celebensis, Boneia bidens, Dobsonia exoleta, Harpyionycteris celebensis, Neopteryx frosti, Rousettus celebensis and Styloctenium wallacei. Several endemic shrews, the Sulawesi shrew, Sulawesi tiny shrew and the Sulawesi white-handed shrew, are found on the island. By contrast, Sulawesian bird species tend to be found on other nearby islands as well, such as Borneo; 31% of Sulawesi's birds are found nowhere else. One true endemic is the fiery-browed starling. Another endemic bird (also found on small neighboring islands) is the largely ground-dwelling, chicken-sized maleo, a megapode which uses hot sand close to the island's volcanic vents to incubate its eggs. Others include the flightless snoring rail, the Sulawesi masked owl, the Sulawesi myna and the grosbeak starling. There are around 350 known bird species in Sulawesi. An international partnership of conservationists, donors, and local people have formed the Alliance for Tompotika Conservation, in an effort to raise awareness and protect the nesting grounds of these birds on the central-eastern arm of the island. The larger reptiles of Sulawesi are not endemic and include reticulated and Burmese pythons, king cobras, water monitors, sailfin lizards, saltwater crocodiles and green sea turtles. An extinct giant tortoise, Megalochelys atlas, was formerly present, but disappeared by 840,000 years ago, possibly because of the arrival of humans. Similarly, komodo dragons or similar lizards appear to have inhabited the island, being among its apex predators. The smaller snakes of Sulawesi include endemic forms such as Calamaria boesemani, Calamaria muelleri, Calamaria nuchalis, Cyclotyphlops, Enhydris matannensis, Ptyas dipsas, Rabdion grovesi, Tropidolaemus laticinctus and Typhlops conradi. Similarly, the smaller lizards of Sulawesi include nonendemic species such as Bronchocela jubata, Dibamus novaeguineae and Gekko smithii, as well as endemic species such as Lipinia infralineolata and Luperosaurus iskandari. The amphibians of Sulawesi include the endemic frogs Hylarana celebensis, H. macrops, H. mocquardi, Ingerophrynus celebensis, Limnonectes arathooni, L. larvaepartus, L. microtympanum, Occidozyga celebensis, O. semipalmata and O. tompotika as well as the endemic "flying frogs" Rhacophorus edentulus and R. georgii. 15 species of viviparous halfbeaks are endemic to Sulawesi, including 12 Nomorhamphus (depicted), Dermogenys orientalis, D. vogti, and Tondanichthys kottelati. Sulawesi is home to more than 70 freshwater fish species, including more than 55 endemics. Among these are the genus Nomorhamphus, a species flock of viviparous halfbeaks containing 12 species that only are found on Sulawesi (others are from the Philippines). In addition to Nomorhamphus, the majority of Sulawesi's freshwater fish species are ricefishes, gobies (Glossogobius and Mugilogobius) and Telmatherinid sail-fin silversides. The last family is almost entirely restricted to Sulawesi, especially the Malili Lake system, consisting of Matano and Towuti, and the small Lontoa (Wawantoa), Mahalona and Masapi. Another unusual endemic is Lagusia micracanthus from rivers in South Sulawesi, which is the sole member of its genus and among the smallest grunters. The gudgeon Bostrychus microphthalmus from the Maros Karst is the only described species of cave-adapted fish from Sulawesi, but an apparently undescribed species from the same region and genus also exists. Orange delight shrimp (Caridina loehae) from Sulawesi. Many species of Caridina freshwater shrimp and parathelphusid freshwater crabs (Migmathelphusa, Nautilothelphusa, Parathelphusa, Sundathelphusa and Syntripsa) are endemic to Sulawesi. Several of these species have become very popular in the aquarium hobby, and since most are restricted to a single lake system, they are potentially vulnerable to habitat loss and overexploitation. 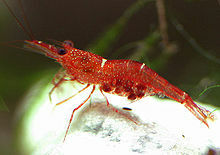 There are also several endemic cave-adapted shrimp and crabs, especially in the Maros Karst. This includes Cancrocaeca xenomorpha, which has been called the "most highly cave-adapted species of crab known in the world". The genus Tylomelania of freshwater snails is also endemic to Sulawesi, with the majority of the species restricted to Lake Poso and the Malili Lake system. The mimic octopus is also present in the waters of Sulawesi's coast. Sulawesi island was recently the subject of an Ecoregional Conservation Assessment, coordinated by The Nature Conservancy. Detailed reports about the vegetation of the island are available. The assessment produced a detailed and annotated list of 'conservation portfolio' sites. This information was widely distributed to local government agencies and nongovernmental organizations. Detailed conservation priorities have also been outlined in a recent publication. The lowland forests on the island have mostly been removed. Because of the relative geological youth of the island and its dramatic and sharp topography, the lowland areas are naturally limited in their extent. The past decade has seen dramatic conversion of this rare and endangered habitat. The island also possesses one of the largest outcrops of serpentine soil in the world, which support an unusual and large community of specialized plant species. Overall, the flora and fauna of this unique center of global biodiversity is very poorly documented and understood and remains critically threatened. The islands of Pepaya, Mas and Raja islands, located in Sumalata Village - North Gorontalo Regency (about 30 km from Saronde Island), have been named a nature reserve since the Dutch colonial time in 1936. Four of the only seven species of turtles can be found in the islands, the world's best turtle habitat. They include Penyu Hijau (Chelonia midas), Penyu Sisik (Eretmochelys imbricata), Penyu Tempayan (Caretta caretta) and Penyu Belimbing (Dermochelys coriacea). In 2011, the habitat was threatened by human activities such as illegal poaching and fish bombing activities; furthermore, a lot of coral reefs, which represent a source of food for turtles, have been damaged. Bunaken Island seen from Manado Tua island. The largest environmental issue in Sulawesi is deforestation. In 2007, scientists found that 80 percent of Sulawesi's forest had been lost or degraded, especially centered in the lowlands and the mangroves. Forests have been felled for logging and large agricultural projects. Loss of forest has resulted in many of Sulawesi's endemic species becoming endangered. In addition, 99 percent of Sulawesi's wetlands have been lost or damaged. Other environmental threats included bushmeat hunting and mining. The island of Sulawesi has six national parks and nineteen nature reserves. In addition, Sulawesi has three marine protected areas. Many of Sulawesi's parks are threatened by logging, mining, and deforestation for agriculture. ^ Technically, Tomini and Boni are defined as gulfs by the International Hydrographic Organization, while Tolo is considered a bay of the Malukka Sea. ^ Watuseke, F. S. 1974. On the name Celebes. Sixth International Conference on Asian History, International Association of Historians of Asia, Yogyakarta, 26–30 August. Unpublished. ^ Everett-Heath, John (2018). The concise dictionary of world place-names (Fourth ed.). [Oxford]: Oxford University Press. p. 1131. ISBN 9780191866326. OCLC 1053905476. ^ Gursky, Sharon L. (2015). The Spectral Tarsier. Routledge. p. 8. ISBN 9781317343974. ^ "Makassar Strait". Encyclopedia Britannica. Encyclopedia Britannica, Inc. Retrieved 23 August 2017. ^ "Researchers find biggest exposed fault on Earth". 28 November 2016. ^ a b c d Von Rintelen & al. (2014). ^ Ian Glover, "Leang Burung 2: an Upper Palaeolithic rock shelter in South Sulawesi, Indonesia". Modern Quaternary Research in Southeast Asia 6:1–38; David Bulbeck, Iwan Sumantri, Peter Hiscock, "Leang Sakapao 1; a second dated Pleistocene site from South Sulawesi, Indonesia". Modern Quaternary Research in Southeast Asia 18:111-28. ^ C.C. Macknight (1975) The emergence of civilization in South Celebes and elsewhere, in A. Reid and L. Castles (ed.) Pre-Colonial state systems in Southeast Asia. Kuala Lumpur: Malaysian Branch of the Royal Asiatic Society: 126–135. ^ Gert-Jan Bartstra, Susan Keates, Basoek, Bahru Kallupa (1991) "On the dispersal of Homo sapiens in Eastern Indonesia: the Paleolithic of South Sulawesi". Current Anthropology, 32(3): 317–21. ^ David Bulbeck, Iwan Sumantri, Peter Hiscock, "Leang Sakapao 1; a second dated Pleistocene site from South Sulawesi, Indonesia". Modern Quaternary Research in Southeast Asia 18:111-28. ^ Peter Bellwood,1997, The prehistory of the Indo-Malaysian archipelago. (Honolulu: University of Hawaii Press). ^ Bulbeck, F.D. 1992. 'A tale of two kingdoms; The historical archaeology of Gowa and Tallok, South Sulawesi, Indonesia.' Ph.D thesis, The Australian National University. ^ Jennifer Hile (12 December 2001). "Explorer's Notebook: The Riddle of Indonesia's Ancient Statues". National Geographic. Retrieved 11 December 2012. ^ Ghosh, Pallab (8 October 2014). "Painted caves challenge art origins". BBC News. ^ Caldwell, I.A. 1988. 'South Sulawesi A.D. 1300–1600; Ten Bugis texts.' Ph.D thesis, The Australian National University; Bougas, W. 1998. 'Bantayan; An early Makassarese kingdom 1200 -1600 AD. Archipel 55: 83–123; Caldwell, I. and W.A. Bougas 2004. 'The early history of Binamu and Bangkala, South Sulawesi.' Bijdragen tot de Taal-, Land- en Volkenkunde 64: 456–510; Druce, S. 2005. 'The lands west of the lake; The history of Ajattappareng, South Sulawesi, AD 1200 to 1600.' Ph.D thesis, the University of Hull. ^ Bassett, D. K. (1958).and ruled a base in Makassar since the mid-16th century to the year 1665, when it was taken by the Dutch. English trade in Celebes, 1613–67. Journal of the Royal Asiatic Society 31(1): 1–39. ^ Balinese of Parigi, Central Sulawesi (Davis 1976), however she gives no source. ^ Eija-Maija Kotilainen – History – 1992. ^ Moss, S. J.; Wilson, M. E. J. (1 January 1998). "Biogeographic implications of the Tertiary palaeogeographic evolution of Sulawesi and Borneo" (PDF). In Hall, R.; Holloway, J. D. (eds.). Biogeography and Geological Evolution of SE Asia. Backhuys. pp. 133–163. ISBN 978-90-73348-97-4. ^ Morrison, J. (2002). "Indonesia: Island of Sulawesi". World Wildlife Fund. Retrieved 5 May 2018. ^ a b Corlett, R. T. (November 2010). "Megafaunal extinctions and their consequences in the tropical Indo-Pacifc". In Haberle, S. G.; Stevenson, J.; Prebble, M. (eds.). Altered Ecologies: Fire, Climate and Human Influence on Terrestrial Landscapes. Terra Australis. 32. ANU Press. pp. 117–132 (see p. 122). doi:10.22459/TA32.11.2010. ISBN 978-1921666803. ^ Aziz, F. (30 May 2000). "The Pleistocene Endemic Fauna of the Indonesian Archipelago". Tropics. 10 (1): 135–143. doi:10.3759/tropics.10.135. Retrieved 4 May 2018. ^ a b Morwood, M.; van Oosterzee, P. (5 December 2016). A New Human: The Startling Discovery and Strange Story of the "Hobbits" of Flores, Indonesia, Updated Paperback Edition. Taylor & Francis. p. 146. ISBN 978-1315435633. ^ a b Groves C. (1 June 2001). "Mammals in Sulawesi: Where did they come from and when, and what happened to them when they got there?". In Metcalfe, I.; Smith, J. M.B. ; Morwood, M.; Davidson, I. (eds.). Faunal and Floral Migration and Evolution in SE Asia-Australasia. CRC Press. pp. 333–342. ISBN 978-90-5809-349-3. ^ Laurent A. F. Frantz; Anna Rudzinski; Abang Mansyursyah Surya Nugraha; Allowen Evin; James Burton; Ardern Hulme-Beaman; Anna Linderholm; Ross Barnett; Rodrigo Vega; Evan K. Irving-Pease; James Haile; Richard Allen; Kristin Leus; Jill Shephard; Mia Hillyer; Sarah Gillemot; Jeroen van den Hurk; Sharron Ogle; Cristina Atofanei; Mark G. Thomas; Friederike Johansson; Abdul Haris Mustari; John Williams; Kusdiantoro Mohamad; Chandramaya Siska Damayanti; Ita Djuwita Wiryadi; Dagmar Obbles; Stephano Mona; Hally Day; Muhammad Yasin; Stefan Meker; Jimmy A. McGuire; Ben J. Evans; Thomas von Rintelen; Simon Y. W. Ho; Jeremy B. Searle; Andrew C. Kitchener; Alastair A. Macdonald; Darren J. Shaw; Robert Hall; Peter Galbusera; Greger Larson (2018). "Synchronous diversification of Sulawesi's iconic artiodactyls driven by recent geological events". Proceedings of the Royal Society B: Biological Sciences. 285 (1876): 20172566. doi:10.1098/rspb.2017.2566. PMC 5904307 Freely accessible. PMID 29643207. ^ Tasirin, J.; Dinets, V.; Meijaard, E.; Brodie, J.; Nijman, V.; Loffeld, T.A.C. ; Hilser, H.; Shepherd, C.; Seymour, A.S. & Duckworth, J.W. (2015). "Macrogalidia musschenbroekii". The IUCN Red List of Threatened Species. 2015: e.T12592A45198901. doi:10.2305/IUCN.UK.2015-4.RLTS.T12592A45198901.en. Retrieved 5 May 2018. ^ a b Whitten, T.; Henderson, G. S. (19 June 2012). Ecology of Sulawesi. Tuttle Publishing. pp. 496–499. ISBN 978-1462905072. ^ Sideleau, B. M. (April 2016). "Recent Records of Crocodiles on the Island of Sulawesi, Indonesia". Retrieved 5 May 2018. ^ Hocknull, S. A.; Piper, P. J.; van den Bergh, G. D.; Due, R. A.; Morwood, M. J.; Kurniawan, I. (2009). "Dragon's paradise lost: palaeobiogeography, evolution and extinction of the largest-ever terrestrial lizards (Varanidae)". PLOS One. 4 (9): e7241. Bibcode:2009PLoSO...4.7241H. doi:10.1371/journal.pone.0007241. PMC 2748693 Freely accessible. PMID 19789642. ^ a b Froese, Rainer, and Daniel Pauly, eds. (2014). Species of Nomorhamphus in FishBase. July 2014 version. ^ Froese, Rainer and Pauly, Daniel, eds. (2014). "Tondanichthys kottelati" in FishBase. April 2014 version. ^ a b Parenti, L.R. (2011). Endemism and Conservation of the Native Freshwater Fish Fauna of Sulawesi, Indonesia. Prosiding Seminar Nasional Ikan IV: 1-10. ^ Saturi, O.S. (31 May 2012). Ikan, Kepiting dan Udang Buta Penghuni Karst Maros. Mongabay-Indonesia. Retrieved 23 November 2012. ^ a b von Rintelen, K., and Y. Cai (2009). Radiation of endemic species flocks in ancient lakes: systematic revision of the freshwater shrimp Caridina H. Milne Edwards, 1837 (Crustacea: Decapoda: Atyidae) from the ancient lakes Of Sulawesi, Indonesia, with the description of eight new species. Raffles Bulletin of Zoology 57: 343–452. ^ a b Chia, O.C.K. and P.K.L. Ng (2006). The freshwater crabs of Sulawesi, with descriptions of two new genera and four new species (Crustacea: Decapoda: Brachyura: Parathelphusidae). Raffles Bulletin of Zoology 54: 381–428. ^ Deharveng, L. , D. Guinot and P.K.L. Ng (2012). False spider cave crab, (Cancrocaeca xenomorpha) Archived 15 May 2013 at the Wayback Machine. ASEAN Regional Center for Biodiversity Conservation. Retrieved 13 November 2012. ^ von Rintelen , T., K. von Rintelen, and M. Glaubrecht (2010). The species flock of the viviparous freshwater gastropod Tylomelania (Mollusca: Cerithioidea: Pachychilidae) in the ancient lakes of Sulawesi, Indonesia: the role of geography, trophic morphology and color as driving forces in adaptive radiation. pp. 485–512 in: Glaubrecht, M., and H. Schneider, eds. (2010). Evolution in Action: Adaptive Radiations and the Origins of Biodiversity. Springer Verlag, Heidelberg, Germany. ^ "Developing Conservation Priorities Based on Forest Type, Condition, and Threats in a Poorly Known Ecoregion: Sulawesi, Indonesia " – Cannon, C.H. et al. ^ "World's best turtle habitat in Gorontalo threatened". Von Rintelen, T.; et al. (2014), "A Snail Perspective on the Biogeography of Sulawesi, Indonesia: Origin and Intra-Island Dispersal of the Viviparous Freshwater Gastropod Tylomelania"PLoS ONE", PLOS ONE, Vol. 9, No. 6 (6): e98917, doi:10.1371/journal.pone.0098917, PMC 4090239, PMID 24971564 . Wikimedia Commons has media related to Sulawesi. Wikisource has the text of the 1911 Encyclopædia Britannica article Celebes. 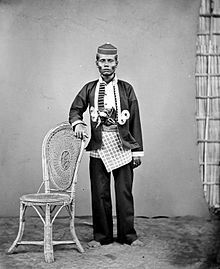 Look up sulawesi in Wiktionary, the free dictionary.